Clipping is a great way to transparently control the peaks of your tracks. When done subtly, clipping will make compressors and reverb sound more natural down the line, and give your mix an overall cohesive feel. But clippers have one glaring issue: They really fall apart when you push them too hard. There seems to be a very thin line between adding cohesion and breaking apart into a distorted mess. That’s where Big Clipper comes in. Big Clipper gives you the controls to be able to push it hard without breaking apart. Whether you need subtle clipping or heavy overdrive, Big Clipper handles it with ease. 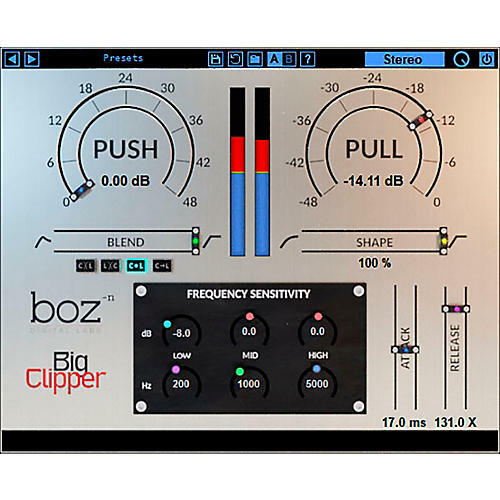 Big Clipper lets you blend the limiter and the clipper in 4 different ways (2 crossover modes, Blend Mode, and Serial Mode) giving you quick access to all sorts of clipping flavors.